For the past year or so, I’ve been playing around with a document hosting/sharing service called box.net. 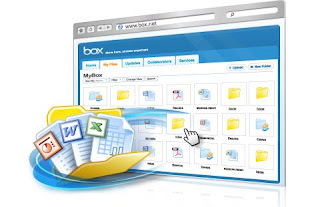 Basically, box.net allows you to upload docs – pdf, word, excel, powerpoint – to their server, and then share those docs with people via the web. First, some docs are too large to email. You may have some high resolution docs that your marketing team created, or a full color recruiting brochure, or a non-proprietary powerpoint that your execs created for a conference…all things that you want to share with leads and candidates, but all large. Too large to email. With box.net, you can simply email them a link to these downloadable files instead. Second, if you’re like many corporate recruiting departments, you may struggle to keep the latest versions of your application forms, background check release forms, driving directions to your office (for interviews), etc all in one place. With a service like this, you can keep only the most recent, approved versions of the docs stored online (and even password protect them if you don’t want just anyone to find them). Third, with box.net’s integration into Linkedin, you can now allow leads and candidates who find your profile (a lot of active candidates are leveraging Linkedin these days to find recruiters at their target companies) to directly access similar files. So active and passive candidates now get direct access to your marketing materials. Just one more way to expose your recruiting messages without lifting a finger. Fourth, if you’re a candidate, box.net would allow you to upload your resume, portfolio of work samples, letters of recommendation, and more to your own linkedin page, for recruiters or hiring managers to access. Want to see how it works? Login to your Linkedin account, then find me – John Vlastelica – to check out my profile and access a few documents I uploaded yesterday. Note: I take no kickbacks or commissions from box.net or any vendors. When I recommend a service, it’s because I like it, not because I’m incented to market it.